A Virginia women's prison has come under fire for moving inmates to a special wing if they "had loose-fitting clothes, short hair or otherwise masculine looks." 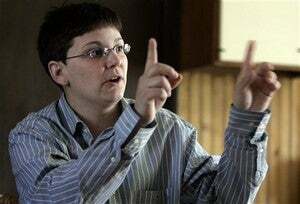 Guards said the segregation at the Fluvanna Correctional Center for Women was deliberate, and that the "masculine-looking women" (like Summer Triolo, pictured) were moved to a wing of the prison referred to as the "butch wing," "little boys wing," "locker room wing" or "studs wing." Guards say building manager Timothy Back came up with the segregation plan as a way of breaking up relationships between inmates. One guard remembers Back saying, "we're going to break up some of these relationships, start a boys wing, and we're going to take all these studs and put them together and see how they like looking at nothing but each other all day instead of their girlfriends." Though material conditions on the so-called "boys wing" were not worse than on other wings, inmates there were kept away from other inmates even at mealtimes, and say they suffered harassment. Prison staff made comments like, "Here come the little boys," when they arrived at the cafeteria for meals. Warden Barbara Wheeler denies that any segregation happened, but inmates say the policy was obvious. Inmate Trina O'Neal said, "I have been gay all my life and never have I once felt as degraded, humiliated or questioned my own sexuality, the way I look, etc., until all of this happened."